It was a happy New Year for NASA. Only minutes into 2019, the New Horizons spacecraft made another historic achievement in space exploration: a fly-by of the most distant object ever visited, the Kuiper Belt Object called "Ultima Thule." At 12:33 a.m. Eastern, January 1, New Horizons passed within 2,200 miles of the KBO, collecting about 7 gigabytes of data that will be transmitted back to Earth in the months ahead. At 19 miles long and 4 billion miles away from Earth, Ultima Thule is equivalent to a 1-inch target seen from 3,000 miles away. What is Ultima Thule, and How Did We Find It? Ultima Thule, which is translated as "beyond the known world," may be a tiny object, but just as New Horizons' encounter with Pluto almost four years ago showed us, surprising and wonderful things can be wrapped up in small packages. The object was discovered by observations from the Hubble Space Telescope in 2014, as part of a search for potential post-Pluto destinations of discovery for New Horizons. As suspected from those observations, and now confirmed by New Horizons, Ultima Thule is a "contact binary": two smaller objects that at some time in the past met each other. And so gently did they make contact, like the lightest of "kisses" between two billiard balls, both remained intact, and did not rebound from each other. The pair have remained joined at the hip from then on, possibly since the earliest times in the formation of the solar system about 4.6 billion years ago. When Ultima Thule (officially designated 2014 MU69) was selected from a short list of candidates as an extended target for New Horizons following the 2015 Pluto encounter, little more was known about it than its orbital characteristics, a rough estimate of its size, and that it had an elongated shape. Added to these meager facts was an assumption that the object was composed largely of frozen volatile materials (ices of water, ammonia, methane, and others), as cold and distant Kuiper Belt Objects are expected to be. With the up-close encounter of Ultima Thule, NASA has bagged not only what were originally two separate KBOs, but potentially any morphological markings left behind by their union, so long ago. Three potential angles to peer into the past is not bad. The Kuiper Belt is a disk-shaped region of the solar system found between the orbit of Neptune (30 Astronomical Units from the sun, 1 AU being one sun-Earth distance) to about 50 AU. First hypothesized as a wide belt of myriad small, icy objects in 1930, it wasn't until 1992 that the first Kuiper Belt Object was discovered, 15760 Albion, orbiting the sun at distances between 40 and 46 AU. Being so far from the heat of the sun and the gravitational disturbance of large planets, the Kuiper Belt represents a vast treasure trove of mostly undisturbed, pristine evidence of the earliest conditions in the solar system. On planets like Earth, meteoric impacts, weathering and tectonic activity tend to erase most traces of times long gone — but no so on a KBO. 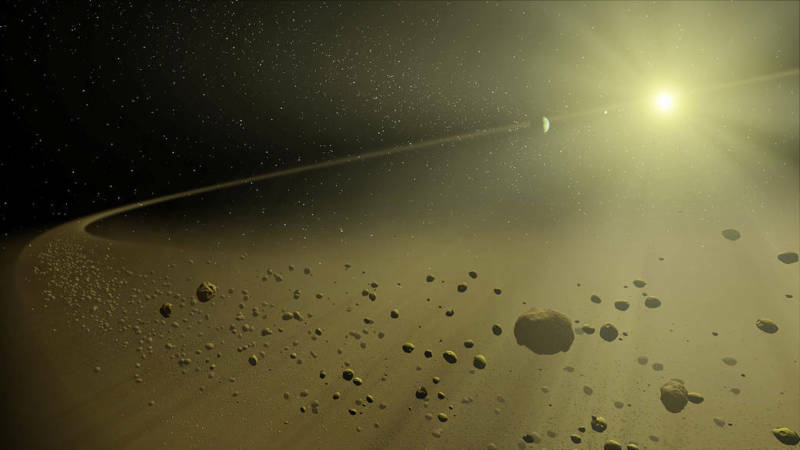 Frozen in time-capsule fashion, Kuiper Belt Objects can inform us of what was going on 4.6 billion years ago that led to the formation of the planets, including the Earth. The data acquired on Ultima Thule will add importantly to the growing body of "solar system archaeological evidence" amassed by other comet, asteroid, and planetary missions, such as OSIRIS-REx, Hayabusa 2, Rosetta and soon InSIGHT. 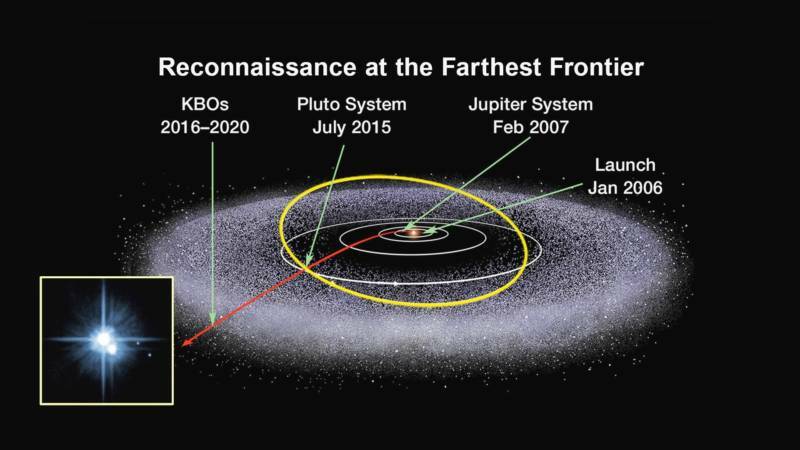 What's On the Horizon For New Horizons Now? 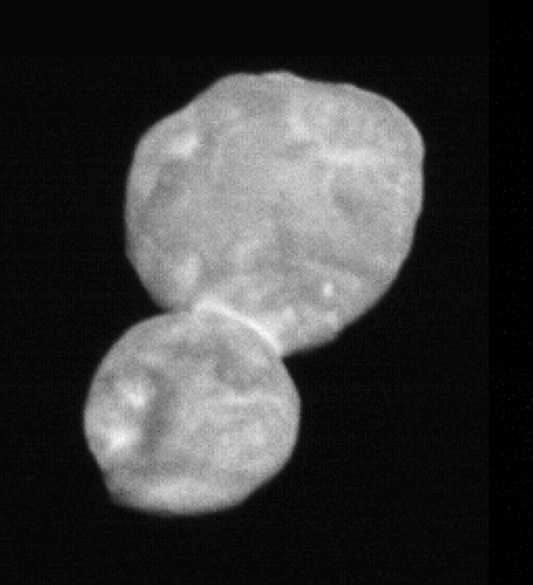 In the months ahead, New Horizons will send back all the pictures and other data acquired during the brief fly-by of Ultima Thule, so we have yet to be dazzled by the crispest, highest resolution images of the tiny contact binary. More to come. 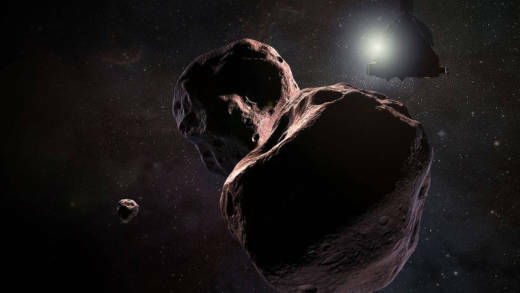 With all systems still functioning, and plenty of course-correction fuel remaining on board, NASA is interested in finding yet another Kuiper Belt Object for New Horizons to target in the years ahead. So the adventure may not yet be over.